Past workshop information is listed below. 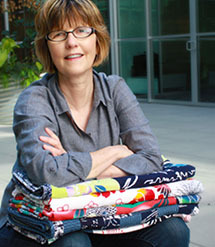 Patricia is a dynamic and creative individual who works with unusually beautiful Japanese fabrics with dramatic results. She will teaching a 2-day workshop entitled “ Doodle Piecing-Complex Curves”. 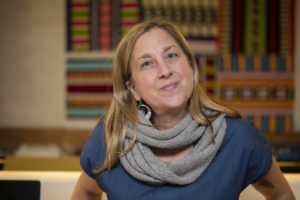 Patricia Belyea is the Canadian-borne, Seattle-based owner of Okan Arts, an on-line and brick-and-mortar shop that specializes in imported Japanese textiles, including yukata cottons. 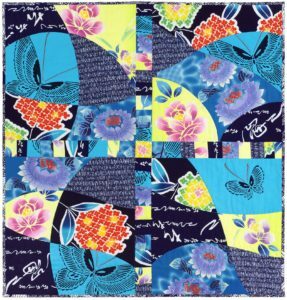 In addition, she specializes in creating innovative quilts, many using yukata cottons, and teaching. 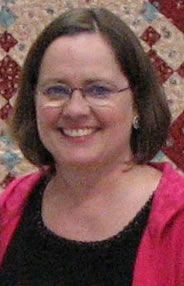 She recently published her first quilting book, titled East-Meets-West Quilts. The workshop will be held in the Santa Cruz Community Foundations at 7807 Soquel Drive, Aptos, CA from 10 am-4 pm and the cost to PVQA members is $70. Click here for the Supply List for this workshop. Jennifer spoke to the Guild about a year ago and there were numerous requests for her to return for a workshop. 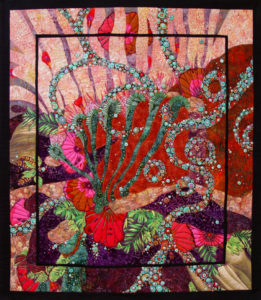 We are lucky to be able to have her back for a workshop is entitled “Weave That” which focuses on her technique for weaving fabric strips together to create a stunning background for appliqued images. Jennifer says: Weaving a quilt background is a little like making a mystery quilt. How you think the finished piece will look and what you get can be quite different. This is part of the fun! While many of the samples below feature applique flowers, your finished background will speak to you about what kind of applique to use. 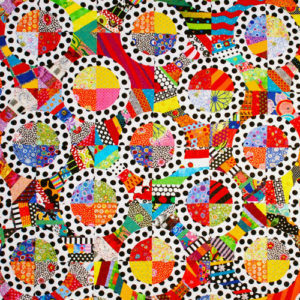 Bring your scraps and join Thom for an in-depth look at how he utilizes his scraps to create his signature quilts, each one vibrant and unique. A domestic sewing machine capable of free-motion stitching is required. The Thom Atkins Workshop is full. If you wish to be put on the waiting line, contact Ellen McCarthy at secondvp@pvqa.org. Click here for workshop supply list. Learn more about Freddy Moran. Add vitality, variety and subtlety to your work by sharpening your understanding and use of the many forms of contrast, key to successful art and design. Discover how to give your compositions a more dynamic and sophisticated look. In a series of short manageable exercises we will explore contrast of value, color, line, shape, texture, size, scale and mood. Working with dark and light, big and small, hard and soft, warm and cool, straight and curved, calm and busy, rough and smooth, organic and curvy, you will find ways of adding visual impact and spark to your work. The class is accompanied by exciting visual support with slides, books and actual textile examples. A short discussion will give a daily focus. 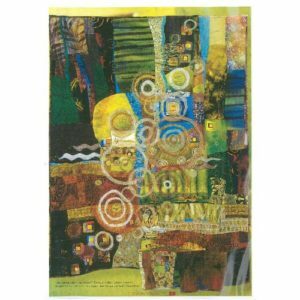 You will be guided in making your own individual small daily paste-ups in fabric / paper. 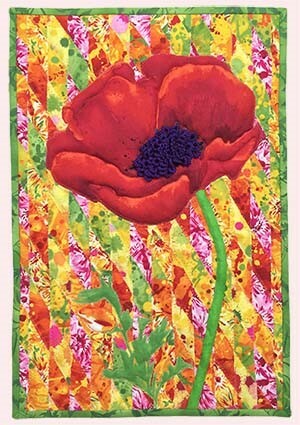 From these you will develop a larger quilt top. 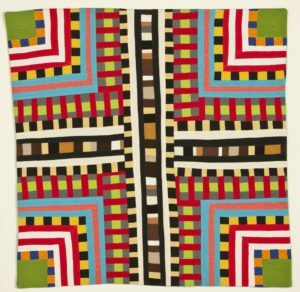 Using solid colored quilters’ cottons, students will learn how to stitch an assortment of pieced prints, including stripes, chevrons, polka dots, and pointy shapes. 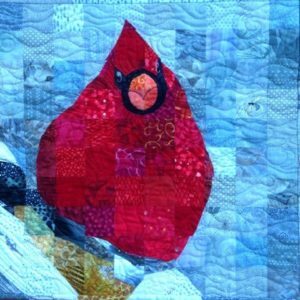 While learning these new techniques, students will also be given information about working with solids, improvisational piecing techniques, and ideas for taking these techniques and creating original quilts. 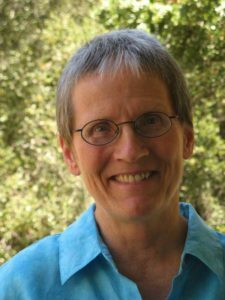 Learn more about Maria Shell. Sandra Bruce, an award winning art quilter with a background in illustration and lettering, will be leading a 2-day workshop. The workshop, “Material Matrix”, is inspired by the painter, Chuck Close. It involves using a gridded photograph and interpreting each 2-inch square into fabric, using piecing to achieve the effect. Everyone in the class works on the same project and Sandra will provide a template and handouts so the pieces can be finished at home with confidence. She will also discuss how to select a good photo to use in future projects; color and value; loose curved-piecing; and how to grid your own photo using Sandra’s unique technique. Practice free-hand rotary cutting while working with strings (long, thin pieces of material, often left over from other projects). Using both scraps and new material, we’ll cut, arrange and re-arrange strips, then sew larger units together. We’ll combine these to make original quilts. Work small or work large, and by the end of the day, you’ll have finished a project or see the way to complete it. 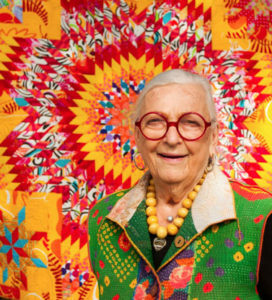 She will bring many quilts to the workshop to inspire you. 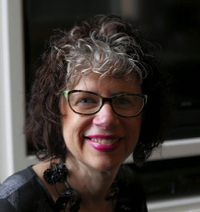 One day workshop with award winning instructor Nancy Rink. 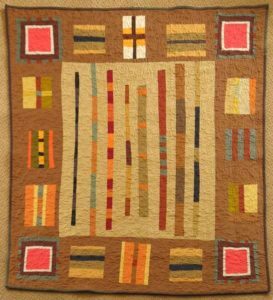 Learn to make an updated improvisational pieced Lone Star using strips and bits. 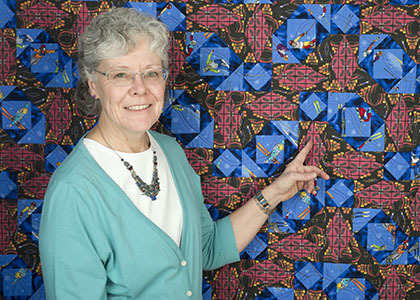 This workshop merges the traditional Lone Star techniques of set-in seams and 45-degree diamond cutting with modern improvisational piecing. Add appliqué in the corners for a bit more pizazz! This quilt pattern shows off a beautiful panel or large-scale print like yukata (Japanese kimono fabric). Tracey will bring lots of yukata for purchase at the September meeting, allowing you to choose coordinates from your stash before the October workshop. 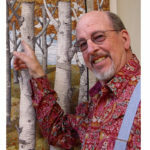 Or bring your own large-scale print as a focus fabric. Cool fact: the half-square triangle blocks in each additional border increase in size by exactly 1 inch.